Cricket is a popular sport in many Commonwealth countries including the UK, Australia, and India among others. It is also played in some non-Commonwealth countries such as the Netherlands – the country’s national team has regularly participated in international cricketing events including the World Cup. While cricket is a non-contact game, injuries arising from the game can occur in different ways. They may vary from minor to moderate injury. • Micro Trauma injuries – They are associated with almost all aspects of the game including batting, bowling, running and throwing. Other factors that contribute to micro trauma injuries include training, footwear, playing surface and conditioning. It is therefore important to take precautionary measures to help prevent cricket injuries. These may include pre-participation screening, pre-season conditioning and wearing protective gear. It is also crucial to seek medical attention when you’re injured. Chiropractic care can be an effective treatment option you may want to consider. This method may not only treat minor injuries but may also help to prevent some injuries in cricketers. Chiropractic care is very popular among athletes as it is a natural, non-invasive way which may support boosted health and performance. Many athletes, including cricketers, use chiropractic care regularly. The stress and force exerted on the body when playing cricket can cause the vertebral column to lose their proper structural position. These misalignments which are commonly known as subluxations cause nerve interference and can weaken the structure of the spinal column. A chiropractor can identify these misalignments by adjusting the spinal column manually. This restores the spinal column and nervous system to an optimal level of function maximizing the performance and healing potential of your body. 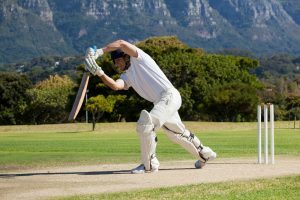 If you’re a cricketer looking to improve your sports performance, getting chiropractic advice is a great option. At Bradford House Chiropractic Clinic, we offer chiropractic care to cricketers to help prevent and treat minor injuries. Call us today at 01962-861-188 to arrange an appointment. This entry was posted in chiropractic and tagged chiropractic, chiropractic care, sports injuries. Bookmark the permalink.